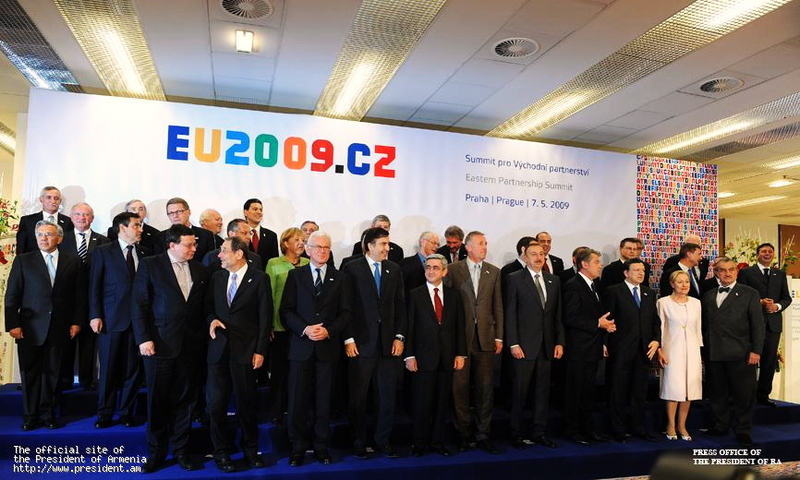 On Thursday 7 May 2009, the EU together with its Eastern neighbours officially launched the new and ambitious Eastern Partnership. This initiative will complement the existing European Neighbourhood Policy and allow countries like Armenia to co-operate more strongly with the EU. Below we provide you with a brief summary from Reuters as well as the official declaration. PRAGUE, May 7 (Reuters) – The European Union launched a plan on Thursday to forge closer political and economic ties with six former Soviet republics while assuring Russia it is not trying to muscle in on its sphere of influence. The EU’s eastern neighbours Armenia, Azerbaijan, Belarus, Georgia, Moldova and Ukraine are suffering from the global economic crisis and the EU is keen to prevent instability in a region that carries all its gas imports from Russia. “It should not be a fight for influence,” said Czech Prime Minister Mirek Topolanek, whose country hosted the first summit of the EU’s new Eastern Partnership in Prague. “It is in the vital interest of the EU to have economically, politically and socially stable partners who have good governments that uphold human rights,” he added. The partnership has funding of 600 million euros ($799 million) and focuses on easing rules on visas and on strengthening energy and economic ties. It could spur tens of billions in trade and investment, just as happened during the integration of the EU’s eastern member states, Czech Deputy Prime Minister Alexandr Vondra said. Russian Foreign Minster Sergei Lavrov said on Wednesday he wanted to believe the EU was not trying to build a power base on Russia’s borders. “We shared our concerns that there are those who may wish to present the invited participants with the choice: either you are with Russia, or with the European Union,” he told a news briefing after talks with Polish counterpart Radoslaw Sikorski. Vondra expressed disappointment that several EU leaders, including Britain’s Gordon Brown and Nicolas Sarkozy of France, were not attending. Only 17 of the 27 states sent their leaders. “I would have hoped all EU states would be committed, because it’s in the wider EU interest,” he told reporters. Some leaders from the eastern partners also stayed away, including Belarus President Alexander Lukashenko, who has been criticised in the West for his handling of political opposition. One concrete aim of the EU plan is the long-term liberalisation of visa rules for partnership countries. Countries with solid governance can use the partnership programme to negotiate association agreements with the EU, a form of closer cooperation, which in turn could lead to setting up free trade areas. “This is not just about political statements — we are now going to develop very concrete projects,” said European Commission President Jose Manuel Barroso.